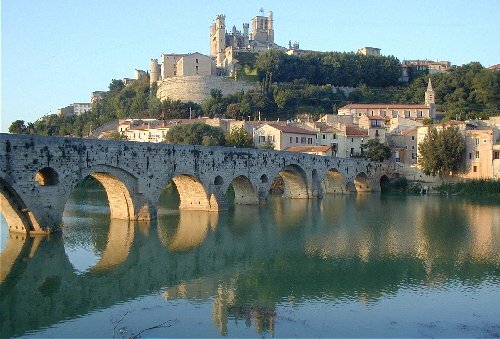 The Faubourg, (False Town, really the town outside the Mediaeval walls, suburbia, outskirts), spans the river Orb at Béziers, in the Languedoc (Occitanie) region of Southern France. built on the original Roman foundations of the ancient Roman Domitian way "Via Domitia", and beyond, the Cathedral of St.Nazaire. dwarfs the Faubourg's own Parish church of St Jude. 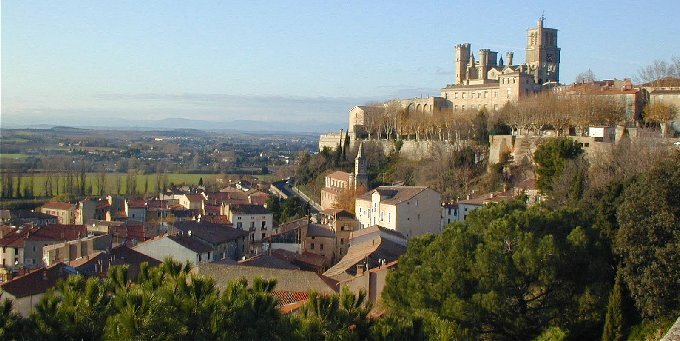 The "Fête du Faubourg", (22nd of August each year) is the anniversary of the liberation of Béziers in 1944. The day starts with a Service of Remembrance in the Church of St Just during the morning, followed at mid-day, by the laying of Wreaths at the Faubourg War Memorial. In the evening there is a Grand Banquet on the Banks of the River Orb, provided by the local Residents' Association (Groupement du Faubourg) and the presentation of a "Son et Lumière" with fireworks presented by the Mairie (Town Council) and after the fireworks the evening ends with a Concert in the park. The theme of the son et lumière has commemorated the life of Jean Moulin leader of the French Resistance during WW2 who was born in Béziers in 1899. The "Moulin de Bagnoles", an old water mill on the riverbank, is now an exhibition space. The park that bounds the river at this point is a verdant and tranquil spot. A little further downstream again is "La Maison de la Vie Associative" its rabbit-warren of rooms, that once housed "The Little Sisters of the Poor", home now for the myriad of Béziers' clubs and societies. Just across the river is the new base of the Canoe Club. 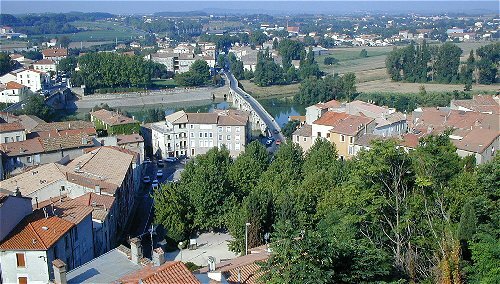 Continuing in the direction of the nearby sandy beaches of the Mediterranean Sea, the river is crossed by the historic Canal du Midi (designed and built by another of Béziers' sons, Pierre Paul Riquet) on a "Pont Canal" (an aqueduct) which bypasses the two lowest locks of what was a staircase of nine at Fonseranes. The seven that remain are spectacular, and an absolute must for a visit if you're in the area. From the locks you cross the pont canal (on foot or by boat) from where you will get views of Béziers and the Faubourg, then continue via the new lock to the port of Béziers. Copyright: © 2003-2019, Sysnix Consultants Ltd -- All rights reserved.